Hello, and welcome to the online home of Victoria and Kelly Zigler, as well as the Keroberous Publishing company! Keroberous Publishing is the publisher name that appears on Victoria's paperbacks and audiobooks. The publishing company was created to honour our beloved West Highland White Terrier, Castellan Keroberous. For information about Victoria and her books, as well as information on how to contact her, check out her “About Victoria” page using the “Pages On This Site” drop down menu at the top left of this page. You can do the same for details about Kelly, including information on how to contact him. We also have a few other pages you can check out if you’re interested. Alternatively, you can check out our family and friends’ web sites via the drop down menu on the top right of the page. Basically, just take a look around, and enjoy your visit! 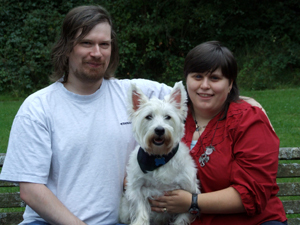 Though we lost our beloved West Highland White Terrier, Castellan Keroberous, in August of 2014, the photos of us that include him will remain on the site in his memory, and will not be updated. Please note: any cookies on my website are used to ensure normal website functions (for instance, YouTube videos won’t work without their own identifiers). These cookies cannot be switched off because the website wouldn’t work properly anymore. However, these identifiers do not store any personal data. Also, please note that by contacting either one of us via any of the options listed on this website, you are agreeing to be contacted in return. However, any information you share with us will not be shared with others or used in any way we do not first obtain your permission for.